"Ding dong, the mortgage is dead," a jubilant Sean Cooper announces as he sets fire to his mortgage in front of cheering friends outside a Toronto restaurant. "I feel like the weight of the world has been lifted off my shoulders," he declares. Cooper has just achieved what many Canadians aspire to do: pay off our home and celebrate with a mortgage-burning party. He just did it decades faster than most of us. In 2012 Cooper bought a house in Toronto for $425,000. He then embarked on a painstaking financial plan - including working three jobs and living like a pauper - to pay off his $255,000 mortgage as soon as possible. He achieved his goal in just three years and two months - at the age of 30.
Cooper was driven by a deep desire to free himself from the stress and risks of carrying huge debt. "For a lot of people, their mortgage is like a life sentence," he says. "I just wanted to not have a mortgage hanging over my head for the next 30 years." Canadian household debt has risen to record levels, thanks largely to fat mortgages fuelled by rising housing prices. Over the past year, the amount Canadians owe on their homes has jumped 5.9 per cent - totaling a whopping $1.34-trillion in September. The surge has been a continuing concern for the Bank of Canada. "Financial vulnerabilities in the household sector continue to edge higher," warned the central bank in a recent statement. Households would become even more vulnerable if home prices drop or interest rates rise. Cooper says he learned at a young age the risks of carrying crushing debt. His mother lost her job during the dot-com crash in the early 2000s. As a single parent with no second income, she also almost lost the family home. "I didn't want to be in that situation. I saw how tough it was on her," he says. So when Cooper bought his home, he put all his energy into wiping out his mortgage. That included working up to 100 hours a week. Cooper works full-time as pension analyst for a consulting firm. He's also self-employed as a freelance financial writer. "On the weekends and evenings, I would do freelance writing so, while people were out having a good time, I was usually inside on my computer working," says Cooper. And that's not all. Up until last year, he also worked part-time, making $13 an hour as a clerk in the meat department at a grocery store. Cooper happens to be a vegetarian. "It wasn't the most glamorous job but it helped me pay off my mortgage, so I can't complain," he says. Working multiple jobs wasn't his only sacrifice. 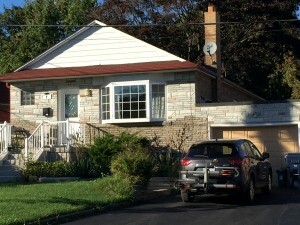 His three-bedroom bungalow includes an extra basement apartment. To maximize his rental income, Cooper lived in the basement and rented out the rest of his house. "Most people, when they hear this, they either think I'm crazy or ambitious, hopefully mostly the latter," he says. Between his work and rental income, Cooper netted about $100,000 a year. He was able to put most of his earnings toward his mortgage by living super-frugally. Cooper biked to work, brown-bagged his lunch and made dinners at home. "Kraft Dinner's probably been my best friend the last three years," he says. He also refrained from splurging on nights out or vacations, admitting, "Sadly, my most exciting trip to date was a 24-hour bus ride to rural Wisconsin." Cooper's friends at his mortgage burning party are proud of his achievement but don't feel they could do the same. "I don't know how he did it," says Eunice Huot, who has a $350,000 mortgage. "I actually sat down and tried to plan out my finances and see if I could actually do something like that but, no." "I think it's outstanding," says friend, Norah Isbister. However, she admits, "I don't think I could live that frugally." But Cooper believes the sacrifices were worth it. And he encourages other Canadians to view the current low interest rates as an opportunity to pay off loans rather than borrow more cash. "When rates are higher, and I definitely think they will be, your mortgage is going to cost a lot more money," he warns. Now that Cooper has reached his goal and owes no other debt, he's already cut back a bit on his work hours. He also plans to spend more time with friends and do some long overdue travelling. "I'm going to loosen up and enjoy some things I've been depriving myself of," he told his friends during his speech at his party. But some habits die hard. At last check-in, Cooper is still living frugally and holding down two jobs. And even though he's paid off his mortgage, he's still renting the upstairs and living in his basement. Cooper says he'll move upstairs when there's a wife in the picture.